We are coming up with a new series on Azure & Cloud Computing. 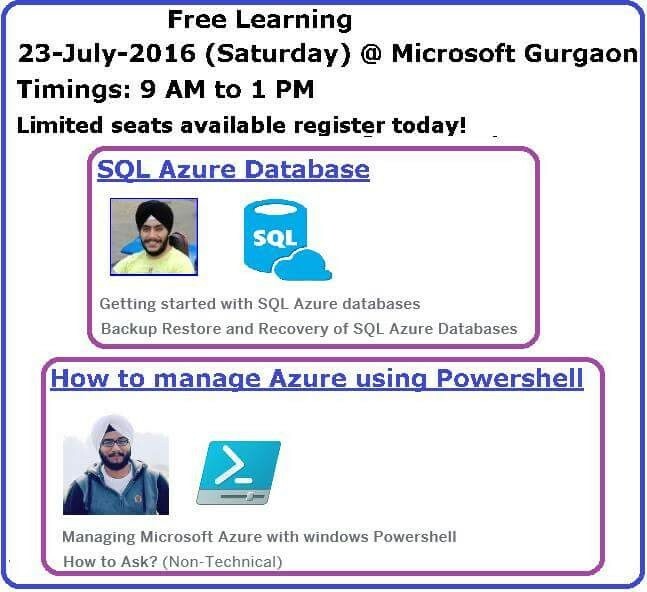 This time Aman Dhally (Powershell MVP) will join me in these sessions. Abstract: This session will introduce you to Azure SQL Databases. Learn how to create & Manage SQL Azure Databases. It will be a Demo oriented session. Abstract: In this session Aman will teach you how to connect and manage Microsoft Azure using Powershell. Abstract: In this session you’ll learn how to restore SQL Azure databases, how to do a point-in-time recovery of SQL Azure databases, what are the caveats and common pitfalls to avoid. This will be Demo based session. Please do bring one Photo Identity proof for security formalities, See you at the event.